Most lists of the best WordPress themes for blogs will give you too many options. What good is a list of 30 WordPress themes to help you make a decision? Of course, you can scan through the 40,000 themes on ThemeForest. Or, we could help you with some curation! This post will outline what we consider the 7 best WordPress themes for blogs in 2019, and you can choose your own adventure. Basically, we’re all looking for something specific. What are you looking for? I’m a blogger who likes minimalism and simplicity. I’m a blogger who likes flexibility and the ability to customize everything. I’m a blogger who wants to monetize my site. I’m a blogger who operates at high scale. 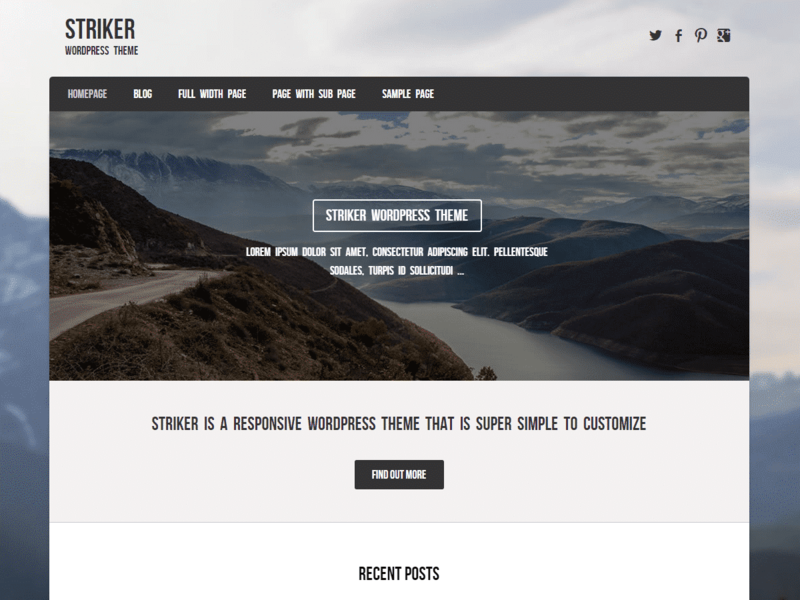 I’m a blogger who wants a free WordPress theme. I’m a blogger who wants a unique WordPress theme. I’m a blogger who likes a beautiful website. MInimalism is in. Especially for writers who just want to focus on writing, it’s nice to have a WordPress blog theme that doesn’t get in the way. It just acts as a necessary liaison to deliver your content to the masses (or the niches, I don’t know what you write about). 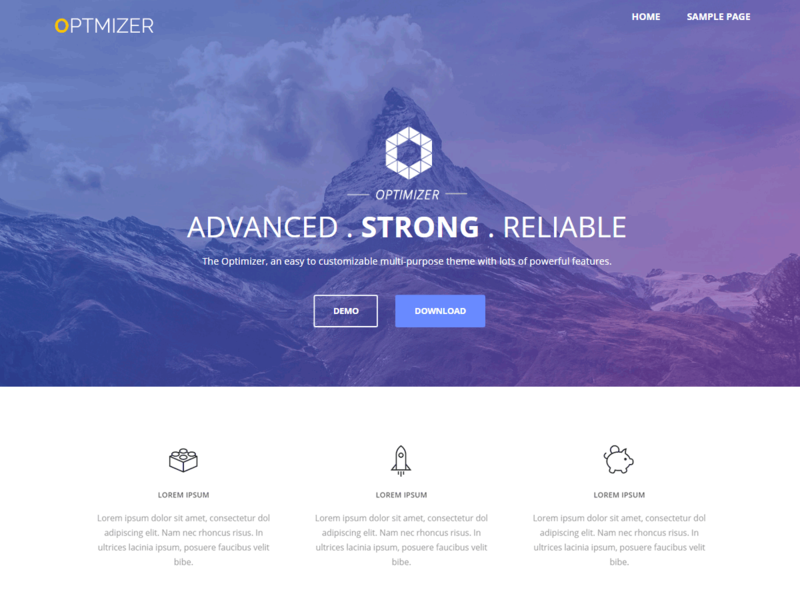 While simplistic design is the trend now and you won’t have trouble finding simplistic WordPress themes, Modernize is one of my favorites in the category. The nice thing about Modernize is that it was made for bloggers, and it was made to be clean and elegant looking. It’s not crazy customizable, but it’s easy enough to add some WordPress tools like social share icons and web forms if you need to. CityLogic is on the other side of the spectrum. 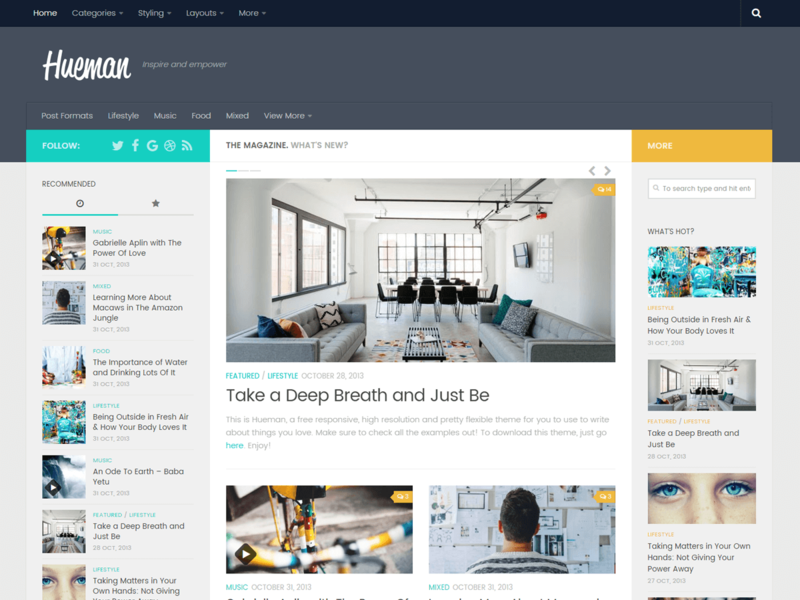 Where many blog themes are aiming for simplicity, this one is aiming for customizability. Its design is a lot “louder” than the previous theme, as well, though still quite modest and good looking. It also integrates smoothly with tools like WooCommerce, WPForms and Recent Posts Widget Extended, and it works well with SiteOrigin’s Page Builder plugin. Basically, you can make this theme into anything that suits your purposes, and you can do so with very little to zero technical knowledge. Public Opinion is a popular WordPress theme for blogs, magazines, publications, and any high traffic site that like to monetize their traffic. It’s super customizable while at the same time providing you a good backbone for design, always maintaining that professional content publication site look and feel. You can hook it up with plenty of useful widgets and custom modules, or you can pretty much just get started publishing right out of the box with little up front work. The coolest part though is that the theme has built in advertising space and the ability to set up membership sites. If you want to run a premium content site, this is a good theme for the job. Of course, Public Opinion is a great option for large scale content publishers as well. But it’s got a special design that seems most focused on magazines, and it has a very specific look and feel. If you want another great option for large scale publishing, complete with great navigation and content architecture structuring, Hueman is excellent. It’s quite popular, with 70,000+ active installation, though it gives you enough flexibility to customize the site to your own specifications. Yes, you can use this theme and look totally unique. Overall, in terms of look, feel, and capabilities, it’s a theme that was definitely built for powerhouse blogs looking to grow and bring in the traffic. If that’s you, give it a spin. Just want to get up and running quickly without much hassle? Don’t have a big budget for WordPress themes? True, there are many free (or at least freemium) WordPress blog themes out there, and there are quite a few simplistically designed ones. But for the most frictionless starting experience, I’d check out Striker. Striker is pretty barebones, but if you just want to start writing and building an audience, it’s going to get the job done. I look at it as a good starter theme. If you’ve got a project you want to noodle around with before investing time and dollars, this is a good one for the job. I’ll be honest, this one is semi-misleading. The real answer is that you can make almost any WordPress theme look unique with enough customization (except for the most barebones minimalist themes probably). The easy answer is that Optimizer is a really easy theme to customize, and you can undoubtedly design it to look unique, even if you’re not very technical. Another benefit to this one: it’s free. It’s one of my favorite themes for any purpose, but in particular for bloggers. It’s just got everything you need, plus an incredibly easy to use visual editor, so you can design things to make your site look unique with little to no coding ability. There a million WordPress themes out there, and to be honest, any of them will work for your blog. But most of them aren’t the ideal solution for your blog, especially because everyone has different purposes. Of course, this list of WordPress blog themes isn’t complete or comprehensive; it’s not supposed to be. It’s supposed to help you make a choice. We’ve covered six key specialties, and I can’t imagine you’ll go wrong with choosing any of the above. Do feel free to comment below if we’ve egregiously missed any great addition to the list, though. I saved 1 hour uploading this post from Google Docs to WordPress using Wordable.